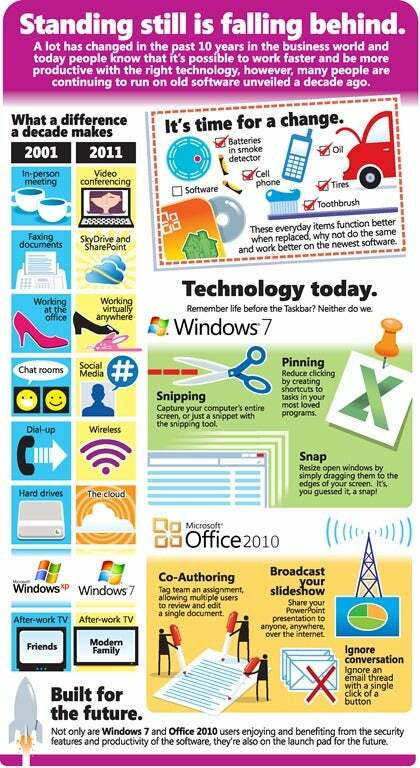 Microsoft wants to hustle users along and onto Windows 7. "Think about phones -- would you even carry a flip phone now? Think about music-- would you still claim that Destiny's Child is your top favorite band (if you or your wayward self ever did)? Think about hair--are you still rocking the same cut? Why then are you still on Windows XP when Windows 7 is so much better?" Subtext: You're hopelessly behind the times, XP users. Libby's post even includes a colorful infographic to drive the point home.